Bottom carton staplers look and work in an interesting manner. This stapler may be overlooked at times but it is one the most important regarding packaging with staples. A bottom stapler also called a foot stapler is used to close or seal the bottom of corrugated boxes. To use this device an operator has to invert the empty carton and place the flaps accordingly on the post. When the foot pedal of the stapler is depressed (or foot switch is triggered, for the pneumatic operated), the stapling head comes down and applies the staple firmly on to the bottom flaps. Bottom staplers can broadly be identified using 3 categories: the type of staples it uses, the method it uses for operation and the parts of a box it staples. For the type of staple used a bottom stapler can require an A-Staple, C-Staple or a 53-Staple. An A-Staple is a 1 3/8 inch wide staple with a length that will go up to 7/8 inch. The C-Staple is a staple with a 1 1/4 inch width and with length that can be from 5/8 inch to 7/8 inch leg. Finally, a 53-Staple is a kind of staple that is much smaller in size compared to the A-Staple or C-Staple. It is less popular in contrast to the other two staples but it still has its applications and is still being used for stapling purposes. Josef Kihlberg still produces the 53 type of staple. Bottom staplers can be triggered in a way that is pneumatic, with a foot switch, or manual, with a foot lever. For entry level a manual bottom stapler is an excellent choice. A pneumatic bottom stapler should be used if a higher rate of productivity volume is required since it is air-driven, thus it can go much faster and will require less manual work to get the job done. Bottom staplers can be classified as either post or side-arm. A post stapler is a kind of a bottom stapler which is used to close or seal the bottom of corrugated carton boxes using a post which helps crush the staple into its staple shape whenever the stapler head is pressed down using the foot lever. A side arm stapler is a type of carton stapler which is used to staple the sides of corrugated carton boxes or trays using the side arm. A post stapler cannot staple the side of a box because the post gets in the way. This is difficult to visualize but understand that a side arm stapler is required. For even faster rates of production an electric stitcher or Bostitch electric FC-95 can be used. 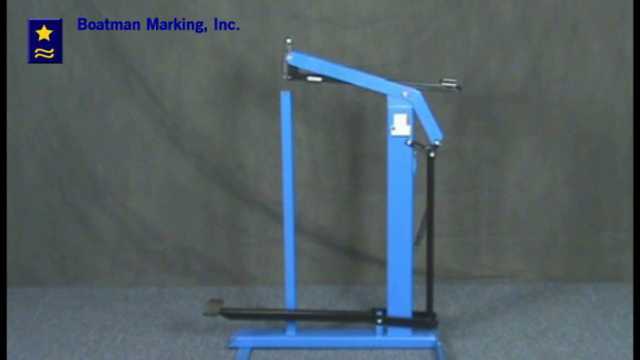 Boatman Marking offers these products as well. Call Boatman Marking now. And we'll make sure we've got all the angles of your staple needs covered.